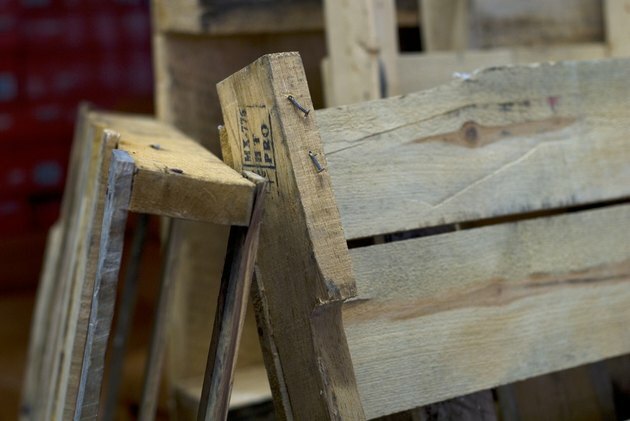 Wooden pallets are originally used to support large packages for shipment, but over time become less sturdy and therefore less useful to businesses. Pallets are then often discarded or sold cheaply by businesses to hobbyists and DIY enthusiasts looking for an inexpensive material with which to build furniture or garden projects. Some of these pallets are chemically treated, which can be harmful to your health; some are heat-treated, which poses little threat to your well-being. 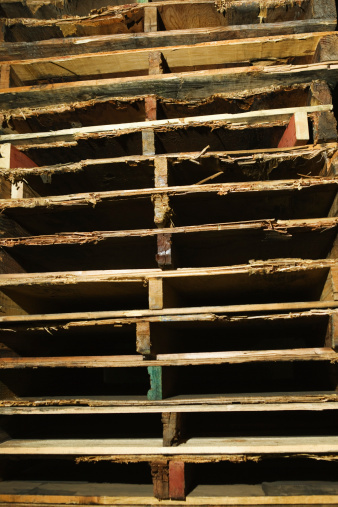 Wooden pallets are marked with a code to describe their type of treatment. Put on the gloves. In case the pallet is treated, you don't want to be touching it with bare hands. Find the stamp on the pallet. It's usually in black ink, and often enclosed in a square or oval shape. Examine the code stamped on the pallet. If the code includes the letters HT, then the pallet has only been heat-treated and should be safe to use however you wish. However, if the code includes the letters MB, then it has been fumigated with methyl bromide and should not be used anywhere that bare skin could come into contact with it or near food. Jessica Briggs began writing professionally in 2011. She has written for high school, college and law school newspapers such as "The Justice" and "The Hoot" at Brandeis University. Briggs holds a Bachelor of Science in psychology and a joint Juris Doctor and Master of Laws in international criminal law and justice.